Reaper of Souls was released on March 25, 2014 and changed the face of Diablo III. At the root of the new Act V and Adventure Mode content and Loot 2.0 revision were a lot of passion, creativity, and gorgeous art. In celebration, Hunters of Diablo 3 Items Art team put together an in-depth look at some of the early works that paved the way to building the award-winning expansion we shared just over two years ago. Some pieces are collaborative efforts among members of the team. 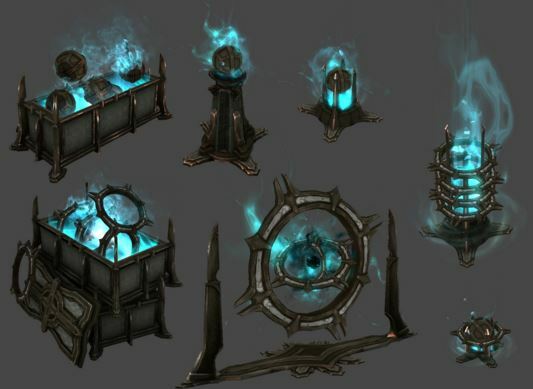 For Pandemonium, Environment Artist Josh Manning created the models below while Principal Artist Chris Ryder defined the style of environment effects that would be used in Pandemonium to represent Malthael. Technical Artist Neal Wojahn—creator of breakables that range from chests to logs to barrels—brought these elements together. Neal: When they are destroyed, they evaporate into dust and mist, as though they were barely clinging to the corporeal realm. I was thinking of how paper burns when it’s being carried up in the hot air of a camp fire and how the materials should look like they were getting eaten away as they drift though the air. Richie: With the vastness of the cave system that holds the sea of treasures we really wanted to convey the epic size of Greed’s Realm. So I created this system of rock formations that elevated the player so they can witness the majesty of this place. This area was one of my favorite places to work on because I was able to use new ways of creating assets as well as the tried and true 2.5D methods that are at the core of Diablo III’s signature look. Next Post:Season 5 Is Ending: What About My Heroes and Diablo 3 Gold?